Contour Latest News from Contour kitchens Which Type of Hob is Right for You? Which Type of Hob is Right for You? The process of choosing a cooktop for your kitchen can be overwhelming since there are so many options available. From gas to induction, each cooktop type offers different functions and benefits – some are more suited to industrial kitchens, whilst others are best for the home. Here at Contour Kitchens, we can help you choose the best cooktop for your kitchen, respective of your needs and preferences. Gas hobs have taken pride of place in many industrial kitchens over the years, and have been widely enjoyed by professional chefs. Offering easy-to-use and efficient functioning, these have assisted with speedy service whilst creating great quality food. Gas hobs are also known for their ability to heat up and cool down quickly, and are easy to control since the size of the flame can be altered accordingly – making simmering and boiling easier to achieve. Gas hobs are also cheaper to run than electric cooktops, and heat tends to spread more evenly across the base of the pan. However, cleaning can be an issue with many gas hobs, with crumbs and spilled food getting stuck around the gas rings. NEFF’s easy-to-clean black tempered glass gas hobs help to solve this issue, with an easily wiped surface that prevents food falling directly onto the hobs. This cooktop also features FlameSelect, which allows the clever control of gas flow – meaning that the size of the flame can be easily tailored to create the desired cooking techniques. Venting hobs by Bora are another great option for the kitchen. Not only do these hobs efficiently cook meals, but they also extract steam, odours and grease particles as soon as they leave the pan. This maintains a fresh smelling kitchen and eliminates the need for a bulky extractor hood. The Bora Professional 2.0 is one of Bora’s cooking ranges, which has been expertly designed with minimalism and style kept in mind. The induction hob is increasing in popularity amongst both professional kitchens and homes alike. Along with their array of safety features as well as environmental and economic benefits, they are an efficient yet environmentally-friendly way to meet your kitchen needs. 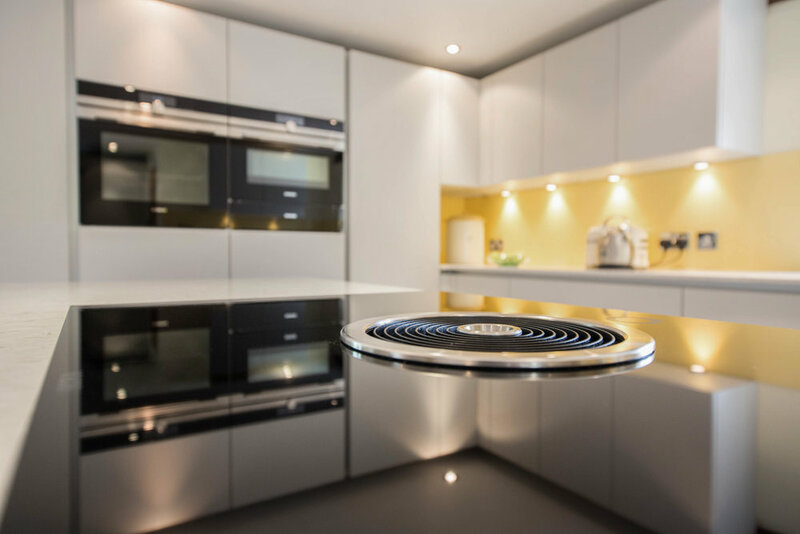 Induction hobs operate by creating a magnetic field beneath the surface; the circuit of which is only complete when a compatible pan is placed on the hob. This means that only the pan itself is heated, providing a safer option for families with young children and fast-moving industrial kitchens. These cooktops also only use the exact amount of energy that’s required, meaning that its users will experience its money-saving benefits. The streamlined design allows induction hobs to be subtly integrated within the kitchen; however, induction-friendly pans must be purchased to allow its operation. Additionally, induction hobs allow for the controllability of heat, meaning that food can be heated at very low temperatures. They’re also easy to clean as there are no rings or trivets acting as an obstruction. Gaggenau’s Vario 200 series induction hob allows for complete flexibility, as it has the ability to be combined with all other cooktops within the Vario 200 series range. Additionally, these cooktops have cooking sensor functions so that temperature can be easily controlled within pots. To speak to one of our experts and find out which cooktop is best for you, please contact us here.